Should Sony Make Another Handheld? On Sunday, the Vita will officially turn three in North America. Happy birthday, Vita! Sony's ambitious PSP successor, which was originally envisioned as a way for people to play console-level PlayStation games on the go, was a commercial flop from the beginning thanks to terrible AAA software support, overpriced memory cards, and all sorts of confused marketing. Though the system has become a must-have for anyone who's into indies and niche Japanese games, it just hasn't been able to make a splash in a market dominated by iPads and iPhones. Which raises the question: will Sony make another handheld? Should they? We've sniffed around a bit, but if Sony's got plans to make a Vita successor, they're keeping it close to the chest. Smart money might say they'll stick to the mobile market and their red-hot PlayStation 4, but you never know. 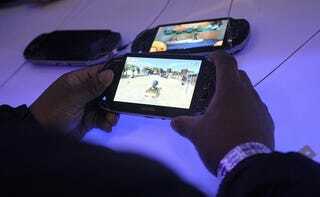 So I open the question to you, dear readers: should Sony make another handheld console? If so, what should their goals be? How can they compete with iOS, Android, and whatever 3DS successor Nintendo's got up their sleeves? Give us your smartest takes—we'll promote the best ones.